Hotel Ashwin keeps client satisfaction as their main motive of service through the best available and elite standards of hospitality the sheer luxury, comfort and world class services from the evergreen friendly staff can definitely relax you and add to your enjoyment and fun for a truly memorable stay. The accommodations at Hotel Ashwin is an example of refined luxury, personal touches and superior amenities and services that provides a forefront of a world's new perspective to the most comfortable stay. 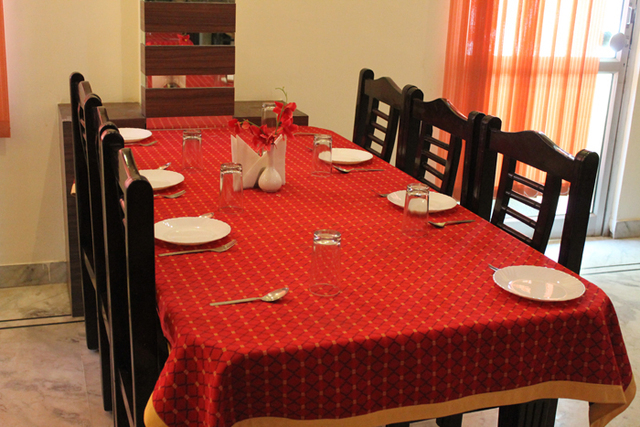 Hotel Ashwin has whopping 24 aesthetically designed and furnished rooms to its name to offer to their guests. You can choose from Deluxe, Super Deluxe and Suites to your desired comfort. The room facilities include that of satellite television, direct dialing telephone, Wi-Fi internet access, and attached bathroom with hot/cold water and round the clock room service, doctor on call, same day laundry, restaurant and garden. All major Credit Cards Accepted. Complimentary Newspapers in Lobby, Internet/Wi-Fi, Safe Deposit Box-Front Desk, Baggage Storage on Request, Family/Child Friendly, Currency Exchange, Smoking Rooms, Doorman, Parking, Front Desk. H/C Water, Child Care, House Keeping, Air Conditioning Room, Cable/Satellite TV, Internet Access, Daily Room Cleaning, Television Room, Basic Bathroom Amenities, Safe Deposit Locker Facility. User reviews for "Ashwin Vatika Hotel Udaipur"